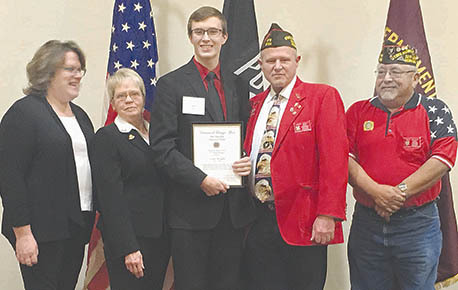 STATE RUNNER-UP — Scott Wright, center, with state VFW officials after receiving his second place award in the Nebraska Voice of Democracy. Scott Wright of Petersburg, a junior at Boone Central High School, was awarded the state runner-up honor last week in the Nebraska State Voice of Democracy Contest. Scott qualified for the state contest as the winner of the local and district Voice of Democracy contests. The top 10 Voice of Democracy winners and top three Patriot’s Pen winners in the state, along with their families, were invited to Lincoln last Friday, Feb. 2, for a day of activities in their honor. The day began with a tour of the State Capitol, and an opportunity to observe the Nebraska Unicameral in session. The group had lunch at the Governor’s Mansion, and heard remarks by Lt. Gov. Mike Foley. 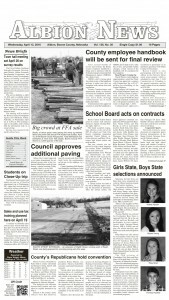 A Parade of Winners and awards ceremony were held Friday afternoon, when students learned their placings. Scott received the second place certificate and a scholarship award. The day concluded with a banquet. The winning Patriot’s Pen essay and Voice of Democracy speech were read at the banquet. Scott was accompanied by his parents, Doug and Michele Wright. His grandparents, Steve and Pam Wright of Albion, also attended the award ceremony.